PHENOMENAL CAMEO DEVICES ON A 1953 WASHINGTON! Out of the 310 examples graded in PF 67 Cameo, this one is one of the heaviest of the bunch in terms of frost! 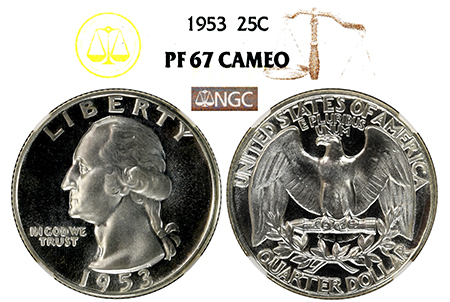 Cameo "Plus” devices are buried in even layers of thick, snow-white frost on both the obverse and reverse. Matching black mirrors hold no spots or visible hairlines! This is a catch of a 1953 Cameo Washington!! !